I think we all like to keep a positive outlook on life, even if our day to day circumstances might cause us to lose focus every once in awhile. Sometimes it's nice to just have a little tangible reminder of those dreams and attitudes we're striving to work toward and build on. Today I want to you to meet a talented jewelry designer and really great gal, Lisa McKenney, from Love Squared Designs. Lisa and I "met" through my "Spiritual Journey" blog, and she has shared with me how she wholeheartedly believes in the empowerment and encouragement of women. This bracelet is my personal "word" of encouragement and truth from Lisa. One thing that most of you in blogland don't know about me is that I really DO have a bracelet compulsion. Call it a fetish, an addiction, or maybe that I just really love bracelets...but I cannot wear just one. nope. gotta have a stack, and this one has been such a perfect addition. Each time I look at it, I'm reminded that God is there watching over me and that He really does call me "Blessed". "Ever since I was a little girl I have loved to create beautiful things. Throughout the years I have created in many different mediums, but I have always loved being able to wear my art. In November 2012 I opened an etsy shop and began to sell personalized soldered photo pendants and ornaments. I loved being able to capture my customers most precious faces in a piece of jewelry. In February of this year I had the opportunity to sell a soldered heart necklace design to raise money to fight human trafficking. Over 500 heart necklaces were sold in a matter of 8 weeks– raising more than $11,000! I had the blessing of witnessing a miracle! I never imagined anything of this proportion was possible but God took my little creation and did something BIG with it!" "This summer I expanded my offerings to include stamped metal and leather jewelry. I have repurposed leather belts and given them a new life and message. 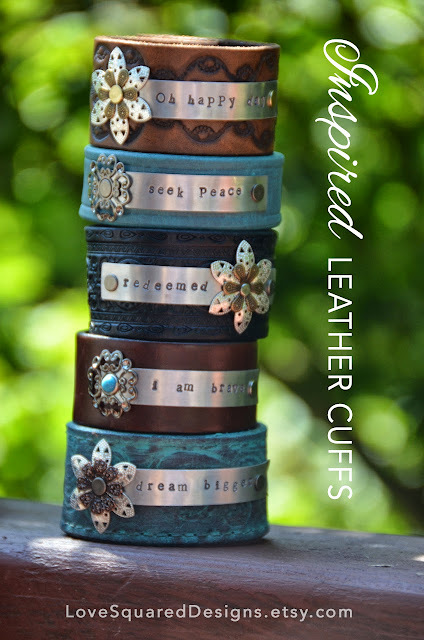 I love creating these custom leather cuffs with words that speak life and hope!" "We all need words of truth and encouragement and what could be better than to wear a beautiful word on your wrist!? It's like having your own Wonder Woman cuff to remind you of your superpower! :) My heart feels most alive when I am creating a beautiful piece of jewelry with a meaningful message. I'd love to create something special for you!" I want to share and support Lisa's amazing shop Love Squared Designs with all my friends and blog followers. 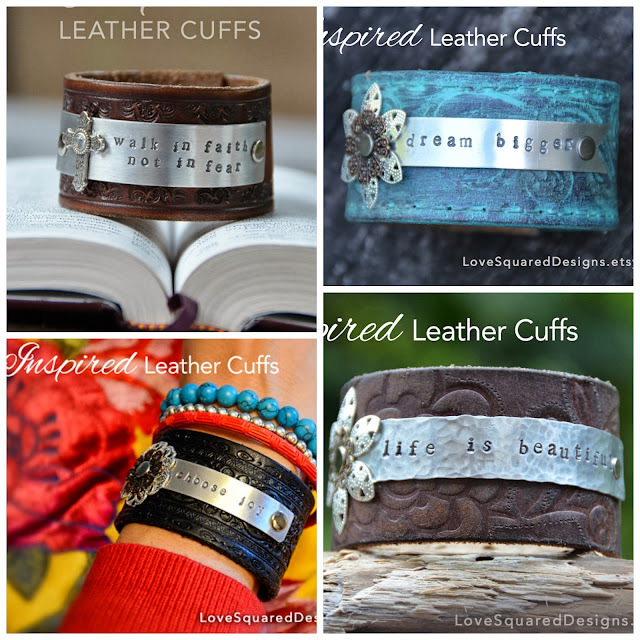 Lisa will be giving away one of her wonderful leather cuff bracelets or a personalized photo pendant to one of you out there. You can choose from her store, or have one that is personally designed just for you. Lisa is also giving a 10% Discount Code for your use during the month of October. Head over to Lisa's Etsy Shop, Love Squared Designs, decide what you'd choose, then come back and let me know, here in a comment. Check out her Facebook Page and sign up to "Like" for news and information on her designs. Be a follower of this blog, Common Ground, and let me know. And if you'd like to give this a shout out on Facebook, Twitter, or your own blog, just let me know for another entry. Debra, these bracelets are amazing! I'm a bracelet person too! I went over to Lisa's shop and fell in love with the photograph mother's pendant. I'm getting one for my niece who just had a baby! Your blog is one of my favorites! I've been following you forever! Thanks for the chance to win this giveaway! As much as I would love to choose something for myself, I would rather choose the Be Brave charm necklace for a friend from church that has brain cancer, for the second time. I think it would be wonderful to give her this for encouragement. I have been your follower for a few years now. Never get tired of coming by for a visit. blessings Debra. I have liked Loved Squared on facebook...keeping my fingers crossed! Debra, What a wonderful giveaway! Lisa is an amazing artist, would be thrilled with one of her pieces! These are wonderful! After looking through them all, I agree with you - I like blessed best. Shared her jewelry on my fb page! I love the turquoise "dream bigger" cuff! I loved all the pretty things. I would choose the "walk in faith not in fear" cuff bracelet. Love, love... Thank you for the give away. Debra, I follow your blog and I love all of your wonderful ideas. Thank you for the give away. I love Lisa's story, and I love the "Pray BIG" bracelet. You know, I'm a long time follower of yours. They are gorgeous! I would chose 'dream big' or 'choose joy', actually just about any one of them would be lovely. I'm a follower. I'm a follower of Common Ground. Thanks for the chance. I checked out Love Squared Designs and I love the "Be Still" necklace. That's my choice. I liked her page on facebook. I am a follower of Common Ground and I told all my friends on facebook about both web sites and the giveaway. Hope I didn't miss anything. They're quite beautiful! It's funny that you say you've always loved bracelets. And I've never been able to wear them for some reason. But then I don't wear jewelry. But I do admire the art of it! The necklace "Blessed" speaks my heart. Such lovely creations...I would choose the Live Your One Beautiful Life necklace! I am a Common Ground follower, too! I am a Common Ground follower. The Choose Joy bracelet is just perfect. I love your cuffs. You have been blessed with a great talent. How can one choose?? They're all just beautiful! But I love the flowered blue and would love it to say 'Hope and a Future.' Her work is brilliant! And BTW, I'm a follower of Common Ground. 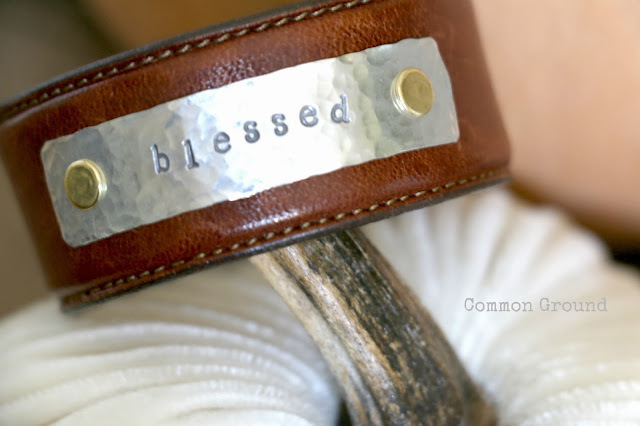 The "Blessed" cuff is the perfect Chistmas gift for someone on my list! BTW love all her designs! I have followed you for a long time with Blogger! I "like" Love Squared Designs on Facebook! just became a fan on Facebook of Love Squared Designs!!! 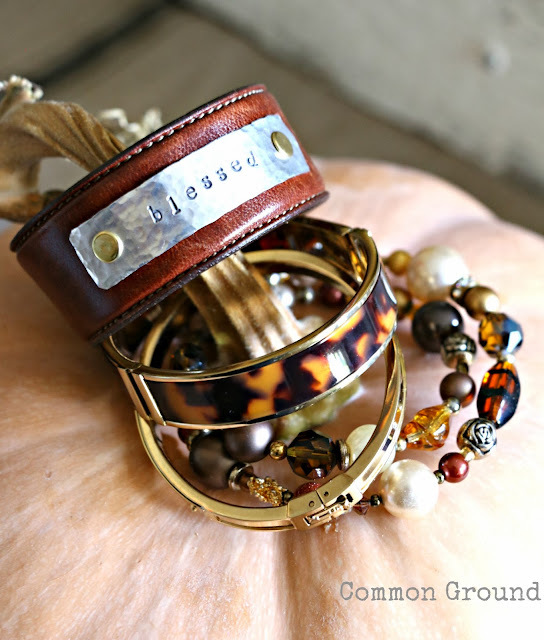 a follower of common ground and I love the redeemed bracelet. I have been following your blog for about a month and love your style and creativity! Thanks for hilighting such an awesome Etsy site... I love her pendant that says "Choose Joy". Several years ago I was diagnosed with a devastating illness. Through the pain, sorrow and lots of tears I found that there really can be peace and that you can choose joy despite the circumstances! Thanks for such a special giveaway! I like the LIFE IS BEAUTIFUL BRACELET. I really like the leather bracelets, Choose Joy or any one of the others. Nice thoughts. i am smitten with a pendant: She's Worth It Heart Pendant. such lovely work. 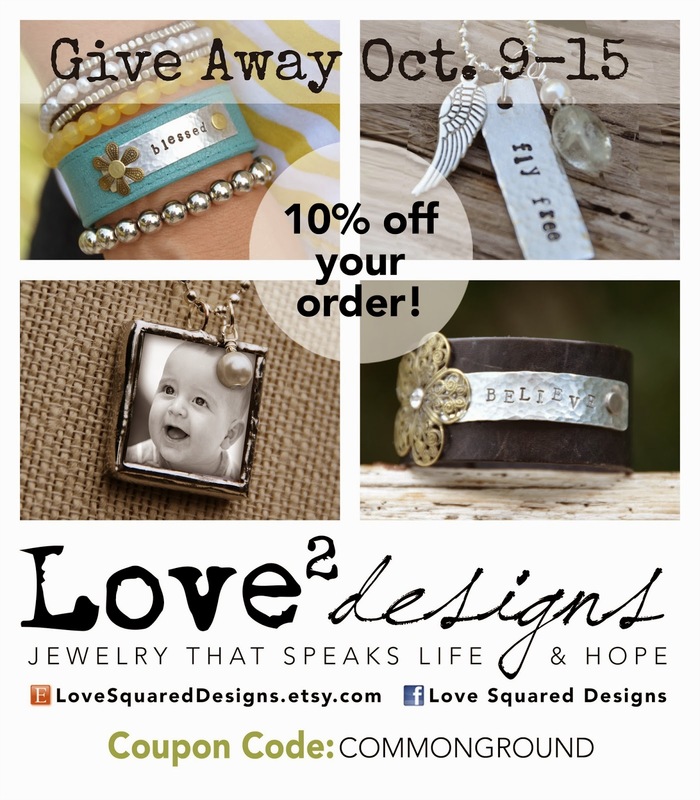 i liked Love Squared Designs on facebook! i shared Love Squared Designs on facebook. and, i am certainly a follower of your blog!!! I love her bracelets and my favorite is God is for me. Thanks! I'm a follower, too! Hugs! Such pretty items in her shop.. 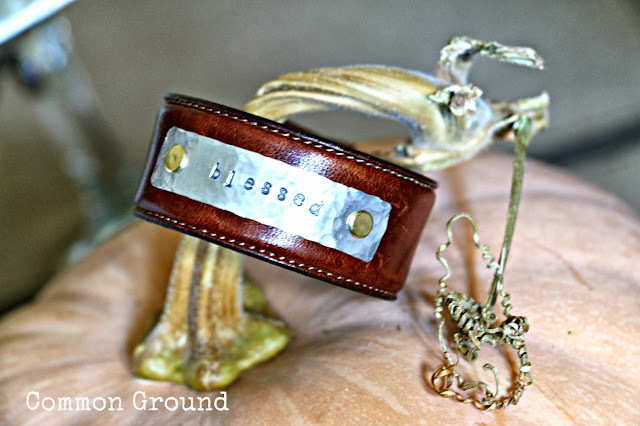 I love the life is beautiful bracelet..
Having trouble deciding between "redeemed" and "blessed" - may have to get both! Wow its so hard to decide. I visited her site. Amazing. The Walk in faith premium leather cuff bracelet, Metal stamped bracelet, Love Squared Designs stands out to me. Thanks for the chance. I liked on facebook also. Thanks again. A follower of yours of course through blog lovin and google connect. What a lovely giveaway! I shared this to facebook and hopefully tagged you in it. I almost missed this great giveaway. Thanks for the chance. beautiful, inspirational pieces ~ each and every one. Love her entire Etsy shop...my favorite is the turquoise leather cuff with flower attached: "dream bigger"!! I'm an avid follower of Common Ground!! I am a follower of yours by email. So many that I like. Maybe the Life is Beautiful.